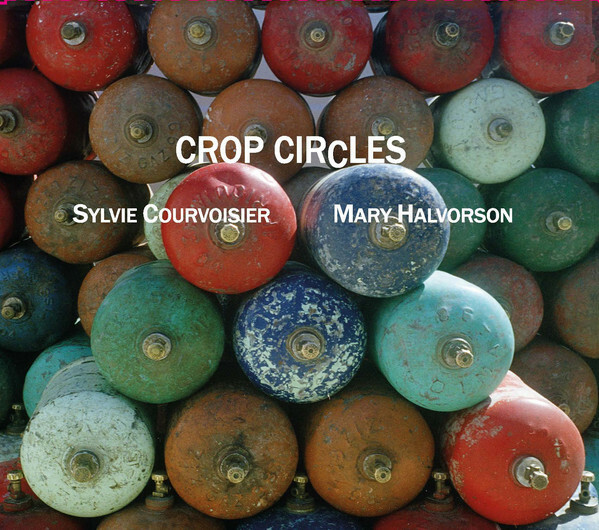 Sylvie Courvoisier and Mary Halvorson’s Crop Circles is an exercise in balance, while still maintaining a great sense of musical freedom. Brooklyn-based Halvorson plays guitar on the collaboration album alongside Switzerland-native and pianist, Courvoisier, also currently working in Brooklyn. The two work democratically, shifting leads and complementing the other’s sound in a way that seems effortless. Throughout the work, neither artist overwhelms the space and there is an electric “push and pull” which encompasses all ten tracks. While each song is quite different in the tone it sets, there is a common artistic style present in the “dancing” which occurs between the two. As we listen to the album, this is apparent in the way both artists move fluently and easily, like dancers in a ballet. The music they play and the timing at which they work is as much a visual experience as it is sound-based. With the exception of “Downward Dog” and “Bitter Apple”, the tracks ease the listener into the experience slowly. There is a consistently delicate touch, either present in the fluttering keys or gently vibrating strings. Halvorson most notably breaks from this on “Absent Across Skies” and “Your Way”. She creates sitar- (track 4) and harp-like (track 6) sounds with her guitar, pushing us to reconsider the possibilities of the instrument. This contrasts the piano’s presence. Courvoisier plays with speed and frequency throughout the album. The sound of keys is immediately recognizable as such, but we do not know when to expect her. On “Absent Across Skies”, her pace introduces the strings and provides a brief direction for the song’s tone. While this shifts numerous times, the piano allows us to anticipate Halvorson’s movement as we begin to hear her strings flickering. This is present in “Aftershock”, as we close our eyes, following the form of a familiar lullaby. As we get further into the song (about a minute), Courvoisier leads into a more charged and aggressive exchange. This continues until we hear a gradual decline of pace followed by Halvorson’s string-plucking which brings the song to a conclusion. This complements Halvorson’s energy until the two come together with Halvorson quietly plucking while Courvoisier steadily taps the keys. The two maintain a beautiful inconsistency, sensing when one sound should be in greater focus and then when the strings and piano should work with a similar intensity. These moments are sporadically curated, and we become aware of them throughout our listening experience. Crop Circles is a visual ballet. The album moves fluidly, at times jumping and scattering into the air. It quickly melts into precise and exaggerated movements. This is evident in “Double Vision”, as we can visualize a figure darting across a smooth surface, feet stretching to a point, and contracting towards the next step. Courvoisier’s piano shapes the composition as Halvorson flits throughout the track. The final minute and a half uses repetition to build up to a climax, finally breaking apart as we feel the silence. We can also see this in “Water Scissors”; a kind of motion in the running “water” rushing and pushing against the rocks (or Courvoisier’s keys). Despite the choppiness of sound, there is still elements of ease and comfort in the way it flows. As the two lead us into the scenes they have filled with their bodies and instruments, playing a kind of “tag”, leaping and sliding through the album, we follow their interaction with our own bodies. We hear the rhythms they have created, see the hurried steps which, at times, become light “pitter-patters” (as each track changes energy levels), and feel the extent of their collaboration in the choreography of “Crop Circles”. This is present in the vivid and lasting imagery the two evoke. Courvoisier and Halvorson open and work this way through the album’s entirety.